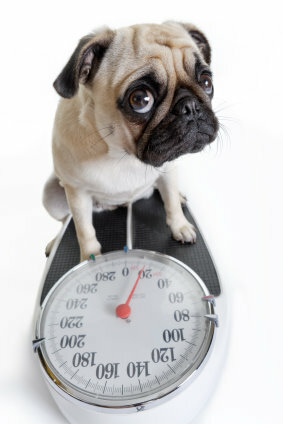 Overweight Dogs: Is Your Pug One of Them? Overweight dogs are a problem in this country. Pugs are very prone to being overweight. They are very cute and they love to eat! Those two traits are a deadly combination. You’ve really got to experience a Pug’s seemingly insatiable desire for food to believe it. They can just have finished their food and be looking for the next meal. Most dogs love to eat and you find your way to their heart through their stomach but Pugs, at least in our opinion, take this to the extreme. The ideal weight for this breed is listed as 14 to 18 pounds but many contend that this is not realistic. This is especially true with a male. A male Pug at 22 pounds does not look fat. A Pug should have a well defined waist and you should be able to feel the ribs easily. Even puppy fat is not acceptable and there are many experts who feel that you should start a rigid eating program right from the start. Some veterinarians have stated that one in four dogs that they see are overweight. They also say that this number is higher for Pugs. This is not surprising. It’s hard to resist a begging Pug and they always seem to be begging. They follow you around everywhere that you go but they seem to get a little more intense when they are in the vicinity of the kitchen or wherever you keep their food. Pugs are definitely likely candidates for the Overweight Dogs Club. Ideally, you will never have a pudgy Pug. After all it’s easier to keep a Pug lean and fit than to try to get a fat one down to size. Overweight dogs do not like to miss a meal. That, by the way is not the best way to trim down a dog (or human for that matter). Rather than skip a feeding, cut the portion down in size. You should always measure the amount of food anyway and follow the instructions from the manufacturer and your vet as well. If you’re trying to get your Pug to trim down, cut the amount of food by one third. Also cut down or even eliminate the treats that they get between meals. In fact, look at the treats that you give your Pug and try to find healthier and less fattening treats. You may want to consider what many other Pug owners are doing to keep their little friend trimmer and healthier. Some are going to a raw diet to help keep the pounds off their Pug. 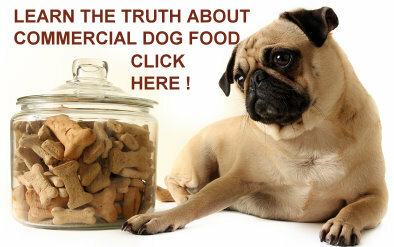 One of the better sources of information on this and the benefits of avoiding commercial dog food can be found here. It is definitely worth looking into to keep your Pug on the healthy side. What About An Excercise Program? Almost any dog will benefit from an exercise program. An added benefit is that the owner might too!